We can build your MQL4/ MQL5 Expert advisors, Inidicators, scripts, and extensions as well as upgrade your MQL4 to MQL5 and debug existing code! Click here to get started. Why do you think automated trading is better than manual trading? Well, there's a saying "Plan your trade and trade your plan". Raymond Toh said in one of his articles "there's no way to make profit trading Forex (or achieving any success in any field) without firmly established rules and the discipline to obey them". You can not obey your rules if you trade manually, believe me: I tried manual trading and lost a lot of money. For the peace of your mind, you have to find a programmer and describe your manual practice to him, and he will give you back an Expert Advisor that makes your manual trading 100% automated! MetaTrader and MQL4 give us the ability to write our Expert Advisors that simulate our manual trading, so, why don't we benefit from those great tools and make our trading live easier? So, you think that it's possible to automate ANY trading system? Most people (traders and programmers) will say NO! I say: "Tell me logically how you trade manually and I'll give you back an automated trading system". We have MQL4 functions that handle the time of trading if you want to trade a specific session. We have functions that calculate Fibo levels for you if you like those entry/exit strategies. Briefly, we have in MQL4 the reference of all of your manual trading practices. Maybe my manual experiment colored my opinion about the manual trading, but I do believe in what I've said! Please go to the custom programming section in this site and tell me what do you want. 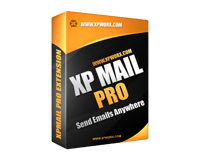 Just 29.95$ to buy the pro version of xpMail dll. Would you like to receive mailings from xpworx about new free downalods, products, special offers and events? Download free Metatrader Expert Advisors - Indicators - Scripts - Tools! Download xpMA indicator and the sample Expert Advisor based on the xpMA indicator. Read codersguru Articles/Tutorials for MetaTrader and MQL4 programming language. Please note that foreign exchange and other leveraged trading involves significant risk of loss. It is not suitable for all investors and you should make sure you understand the risks involved, seeking independent advice if necessary. Read full risk disclosure.